We have seen the bring your own device (BYOD) craze continue to explode into organizations and campuses through the desire to use content creation devices and laptops. Allowing users to connect to your network, find their files, and print can cause operational challenges. Your users expect to be connected wherever they are; working from home, delivering an assignment, or just in between buildings. In addition to PaperCut's other mobile and BYOD printing alternatives, Mobility Print and Email to Print, Web Print is a simple way to manage printing and still track and control what is being printed and from where. Web Print is PaperCut's industry leading solution to manage the growing need for printing from BYOD laptops, wireless devices, and anonymous users. Web Print gives users easy access to print Microsoft Office, PDF, and image files directly from the browser on their own devices without the overhead of installing printer drivers and managing server authentication. PaperCut's Web Print has been deployed across thousands of education campuses and is an ideal solution for offering print services via student owned laptops and netbooks. Web Print is a core feature of PaperCut NG and PaperCut MF. We don't charge extra for this module, nor require you to sign up to a cloud service. It's all locally hosted and in your control/domain/network. For larger organizations, Web Print can be scaled to remove bottlenecks and improve reliability. Through the use of multiple Web Print servers, Web Print scaling increases throughput and minimizes users' wait time for print jobs. Using multiple servers also provides resilience against possible network and server outages. While you can use a single Web Print Server, we recommend a minimum of two. Using only one Web Print server causes a single point of failure and potential bottlenecks. Best practices in server management recommend building redundancy into your network and monitoring the health of your environment. Microsoft Office applications have known security issues that can potentially harm your network and Application Server. To minimize this risk, Web Print offers a sandbox mode, which uses a dedicated virtual machine that is isolated from the rest of your PaperCut system. Job rendering is done using the native applications on the Web Print server. The administrator can also allow access to shared account charging features, equivalent to the options available to desktop users with the PaperCut User Client. Charging to a shared account. Printer maps and plans provide a graphical interface to allow the user to select their closest printer. You can easily create these maps in standard formats, such as, HTML or SVG, or they can be exported from applications, such as, Microsoft Office Visio. 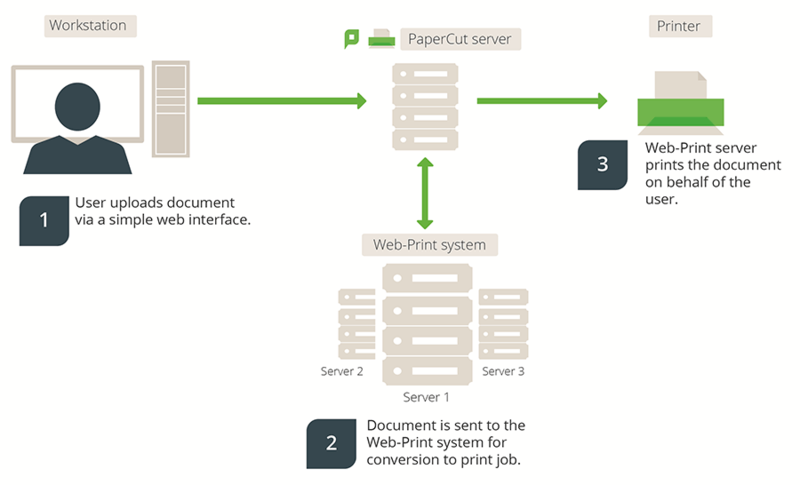 Web Print is fully integrated into PaperCut's standard print charging/accounting/quota process. It does not matter if you're a staff member charging to a faculty or department account, or a student charging to your free print quota, the account selection experience is the same as printing from a networked desktop computer. For more on Web Print configuration, visit our section on mobile print configuration in the manual.